The Fellowship was fortunate enough to obtain a copy of DUNGEONS & DRAGONS: CUTTER #1 from IDW Publishing. R.A. Salvatore and Geno Salvatore write, and David Baldeon draws. Khazid’hea (Cutter) is not just a sword; it’s an intelligent weapon, and a malevolent one. Its wielder is now old and retired, and Cutter wants to be passed on to a new warrior. But the old veteran knows the sword well, and wants its new wielder to know how to control it. But the veteran’s children and the evil sword all have other plans. First, I love that one of the main characters (the antagonist) is not a person. Oh, it’s got a personality, that’s for sure. And it’s not a nice sword, which makes sense when you think about it. To me, that makes it the most interesting character because it’s the one who has a reason to think differently. And second, the art is beautiful in this book. It’s like having another character in the story – that’s how well it works. The combat scenes are an absolute wonder. Please overlook my bias (from more years of D&D than I care to admit) and pick up this book. You will not be disappointed in either the writing or the art. 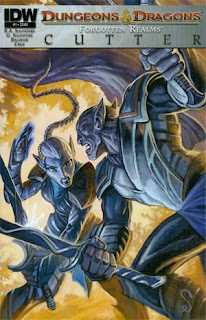 DUNGEONS & DRAGONS: CUTTER #1 is available now at your FLCS or by order at idwpublishing.com.